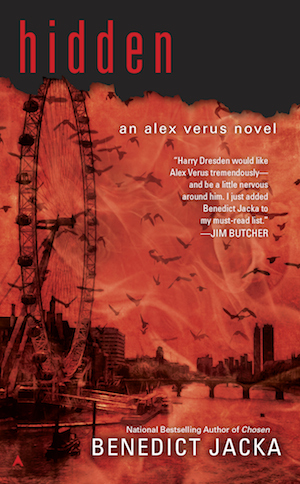 The fifth book in the Alex Verus series. Alex Verus is a diviner who can see probable futures – a talent that’s gotten him and his friends out of many a tough scrape. But what happens when someone doesn’t want Alex’s help? Alex’s friend, the life mage Anne, distanced herself from him when she found out about his past as a Dark apprentice. Now she’s in serious trouble, but wants nothing to do with him. Alex has to start wondering if Anne’s problem is really with him – or if there’s a secret she’s trying to hide. On top of that, rumours are swirling around London that Alex’s former master may be back in town. Alex has no idea what his agenda may be, or who it involves . . .
You can read the first chapter of Hidden here. The following links will take you to online retailers where you can order Hidden. As of September 2nd 2014, Hidden is also available as an audiobook! You can find it at the publisher’s website. Thanks very much for writing the Alex Verus series. I read all 3 books in about 6 weeks which was enjoyable . . . but unfortunate because now I have to wait for the 4th! Please keep writing. Excellent series, as good as Jim Butcher’s Dresden. Keep up the good work. I read these all within a few weeks, I really love them all. Can’t wait for the fourth to come out. After reading Jim Butcher, L.E. Modesitt, Jr., and F. Paul Wilson, I have to add Benedict Jacka to my list of must-reads. Please keep on writing, sir, so I may keep on reading! Hey, I’ve never heard of F. Paul Wilson so thanks for a new author for me to check out! Thank you Amanda Fox. But I agree with the rest, 100%! I never liked reading. It was always hard for me to get into a book series. Like most of society I tend to get pulled into video games and other genres of entertainment, but this doesn’t mean I never allow the opportunity to branch out and try something new. and your book series the Alex Verus Novels. I only came across it in the past week and have already bought all four. I want to give you praise because if it wasn’t for you, I wouldn’t be reading as much as I am. Your character development pulls you in, giving you a sense of attachment. You leave questions open in a world of mystery making the readers think in anticipation as to what can happen next. Your books are an inspiration and are one of the few that I have on my almost empty book shelf. Thank you and in a selfish thought, I hope you continue with this series. Discovered Alex this morning. Now 10 PM, have read all four books and am eagerly awaiting September’s release. Bloody awesome! Do you know when the audio version of this book will be available? Great work again! Really, really enjoyed this book!